What is this tour all about? The characteristics of our tour place it within social-group tours. It tries to give you an opportunity to create such an atmosphere of humanity, passion and sacrifice conditioned by other people’s cooperation that you’ve never experienced anywhere before. The tour is just like an epic long-distance walking trail. Our goal is to share it with anyone around the world. Visa application fee for those who apply from European countries is about 40 EURO and for the other countries depends on the amount announced by Iraq embassy in the country of origin. To get help for visa issuance, you can call our local helpline for free. Using a backpack is a good idea especially when you are going a long distance. You do not have to use big size backpacks or gear up professionally, because initial services and a variety of foods are available for free along the path. Choosing the right shoes is one of the essential parts of a walking trail. Shoes resistant to long distance walking are the best choices. Light shoes provide comfort on a groomed trail. We advise you to use sandals. Sandals are very light, so your legs work less to lift and step. It is preferred to use shoes to which your feet are used. Using the right pair of insoles significantly makes your feet feel relaxed and can prevent causing sweating and swelling. Pack your backpack with personal items like tissue paper, bath towel, toothbrush, sunglasses or sunscreen, and drink bottle. It is highly recommended to carry a portable battery pack. The more weight you carry, the more negative effect it has on enjoying from the path. Therefore, lighten your load by eliminating unnecessary items such as laptops, shavers, irons, etc. How long is the route? It takes three to five days to walk along these routes. You would better take a break of no less than 30 minutes every two hours of walking. There are dozens of the kindness service areas. Some of these kindness service areas, which are called “Mookeb” in the local language, have attached sections with the facility of massage for refreshment. Along the way, Mookebs welcome you in the best way possible! Is it compulsory to walk by foot? The answer is No! However, if one is not willing to walk by foot can continue on the path by the cars moving across the way. Shall I carry food on the way? A large portion of meals is available along the way for free. In some cases, owners of Mookebs persistency force you to take food from Mookebs belonging to them. However, take some nuts with you. Different types of breakfast, lunch, and dinner recipes. We offer a good range of dishes to choose from. You can have sandwiches, fishes or stews. Not only foods are free, but also Mookeb owners eagerly feel proud of it that they beg you to eat from their foods. Ahead are several such scenes that are really amazing. Generally, people insist on putting many fruits in your pocket during the trip. Also, delicious local sweets can be found in several places on the way. A variety of beverages such as water, tea, coffee, fruit juices, etc. is provided as well as sweets. How are these sites settled? These rest places are located at regular intervals along the way. These kindness service areas, from tents to buildings, admitting people free of charge. Native residents call these service areas “Mookeb”. What about cleanliness condition and status of restrooms along the way? The path is cleaned continuously. Some Mookebs optional services. For example, there are Mookebs that a tailor with his sewing needle in hand is ready to serve you by a cloth alteration! Sometimes, shoemakers are available in Mookebs. Do I need to have much money in my pocket along the way? 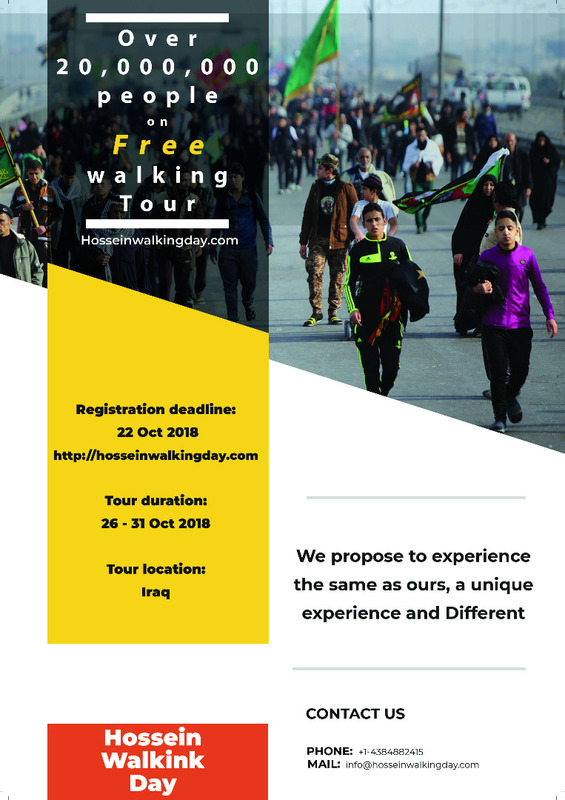 Due to freedom of services during the days of walking, the costs are generally negligible. However, it is always a good idea to have money with you. It is recommended to have Iraqi dinar (IQD) with you. Where can I charge my smartphone and other devices? Many of Mookebs provide portable electricity supply units (nearly every 1 Km). You can charge your electric device using multi-outlet power strip panels available in Mookebs. Are there proper health centers along the way? Health facilities offer medical services at the sites other than a hospital for free. Enthusiast physicians visit people for check-ups and health problems all for free. Moreover, the essential medicines are provided in these centers. What should I do if I lose the group? Route stages are determined by continuous pillars (electricity poles) that play the role of milestones. These pillars are available throughout the path from Najaf to Karbala. The distance between each pillar is 50 meters. The pillars numbered 1 to 1460 can be used to arrange appointments and making coordination.